How can I save money on kids stuff? This page is full of deals just for kids. You can save money on kids food, clothing, toys and more. Every day our savvy parents share bargain buys. Plus, you'll learn information about upcoming toy sales, restaurant deals such as free meals for kids, and cheap days out. You may also be interested in our Amazon Discount Finder which you can use to find cheap toys. Plus, if you're searching for toys that are hard to find because they're out of stock every where, they could well be in our free stock checker. Use the filters to select just clothes, food etc. Kids’ stuff and gifts can be hard to buy as you try to find the best one for your kid’s age which stimulate, inspire and excite. See their face lit up with happiness and excitement when your well-chosen birthday gift, Christmas gift or a special treat for a special occasion is received. Here at Latest Deals, our money saving experts know the best type of gifts to suit your kids at different ages. And most importantly we will take care of your budget with the best possible deals and offers our team of savvy bargain hunters have gathered up online from your favourite UK retailers such as Toys R Us, Smyths Toys, Very, Amazon, Tesco, Marks & Spencer, Debenhmas, Argos, Forbidden Planet, Early Learning Centre and so much more! Enjoy amazing discounts with our cheap kids deals, voucher codes, offers, promos, clearance sale and price drops. Save big on toy sale, toy deals of the week, holiday hot deals, cheap days out and family days out in the UK. Whatever it is you’re looking for whether cheap clothes, bags and gadgets or a family-friendly vacation, you’ll find it here at Latest Deals. Kid’s toys have come a really long way ever since the “old” days, when grown-ups like us were satisfied with just a simple card box and our own imaginations. Today, if you want to play a talking and walking robot, there’s a big chance that it is sitting somewhere on a shelf in your local toy shop or just waiting for you to click that add to basket button on your favourite online toy shop. If you’re on the market for the best toys that can provide your kids with endless fun, here’s a list of wacky and wild games and gizmos that could turn even the grumpiest kid on the block. Whether you’re after a game that can tease the brain of the whole family, a futuristic dog for a robot for your kids who love animal, you will find something on this list for your kids. Air hogs thunder trax, £79.99 at Amazon. This toy may look like your typical remote control fuel tank, but it’s got a nifty trick up its sleeve. Your kid can drive it into water and not only does it float, but it can also be converted into powered RC boat. Anki overdrive Fast and Furious edition, £169.99 at Amazon. This edition of Anki Overdrive comes with two new cars from the popular movie franchise as well as a special power zone track piece and a movie-themed app. Propel Star Wars battle drones, £199.99 at Amazon. This is a great toy to give to a Star Wars fan. Your kids will have fun flying it and the remote controls even features sound effects and music from the original trilogy. They will definitely have an immersive and fun experience with it. Nerf zombie strike dominator, £19.99 at Argos. The biggest Nerf blaster so far in their dart-popping lineup. This spring-powered blaster offers a 24-shot capacity and comes in a funky bright green colour with mouled details that imitates workshop spares. Anki cozmo, £165 at eBay. This is an adorable, downright fun and amazingly clever toy for your little ones to play with. It’ll play with the, say their name when it recognizes their face and it can even be guided around through its view from its built-in camera. Beasts of balance, £65 at Amazon. An addictive toy-stacking video game for the whole family to bond with and enjoy. It may look like a simple game of stacking up a bunch of colourful critters, but it is actually a game of smarts, poise, nerve and strategy. Wowwee chip robot dog, £199 at Amazon. If your kid wants a pet but he’s not allowed to have one, then this is the perfect solution. This chip robot doc is low-maintenance and a great alternative to keep him happy. It will respond to your voice, lie down and sit on command, make happy sounds when being pet, follow you around and even play ball. Camel up, £23 at Amazon. A fantastic family board game for any family gatherings. It combines the comic elements of a madcap camel race and the competitive excitement of a flutter on the gee-gees. Asda. 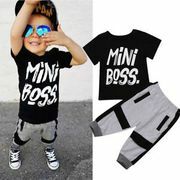 You can buy kids clothing online at Asda’s George shop for the latest fashion for kids and baby clothing with fantastic quality, style and value. Debenhams. The online shop offers high quality, stylish and great value kids’ clothing for boys, girls and babies. They have a fabulous range for any special occasions from boys suits, flower girl dresses and communion outfits, to the latest trend and great value school uniform. Peacocks. Shop the sale of Peacocks at the comforts of your home and take advantage of huge discounts on a wide range of kids clothing. Next. Shop for children’s clothing at Next. They have over 1,000 products you can choose from with fantastic discounts plus next day delivery and free returns available. Boohoo. Discover kidswear at Boohoo, a wide selection of cheap children’s clothes available from age 5 to 12 years old. TK Maxx. Discover the freshest styles for your little ones at TK Maxx, clothes for girls and boys of all ages and toys they'll love. Yours at up to 60% less. Matalan. Shop for kids clothing at Matalan sale and enjoy a savings of up to 50% off no girls and boys ranges. Littlewoods. Get a sweet deal of at least 20% discount on selected lines on over 150 brands at Littlewoods with easy and free returns. School holidays tend to be expensive, so it pays to have a few tricks up your sleeve and a voucher code or two from Latest Deals. Here are some simple tips to ensure to you will spend less when spending time with your kids and the whole family. Timing is always everything, so make sure to always look carefully at your ticket details for any attraction you want to visit. Most have offers like discounted rates for tickets a couple of months in advance. Plan a trip with another family if you want to save more. Places like London Zoo and Whipsnade can provide you with 20% off on tickets if you will go in a group 10 or more. While Alton Towers gives out a 30% savings when booking together online. A lot of attractions lets you keep your day tickets and return without the need to pay any more as many times as you would like over the next 12 months. The Historic Dockyard in Chatham in Kent and The Deep aquarium in Hull do this. Check out the deals you can get with your supermarket loyalty cards, you can actually save more than £100 in Legoland for a family day out in return for a fairly small amount of reward points. Several galleries and museums offer free craft activities and games during holidays. These are specifically designed for kids so that they will not feel like the trip is a boring school trip. Check out your local council’s site for ideas. Dover Castle, Kent. Boasting for an immensely long and eventful history. A brilliant combination of histories for kids of all ages that they can explore and rub about, plus exceptional views of the channel for adults to enjoy. Kenilworth Castle and Elizabethan Garden, Warwickshire. This is one of the most remarkable castles in the country and the best sport to feed your kids imaginations and banish everyone’s boredom. There are plenty of fun activities throughout the year as well. Whityby Abbey, North Yorkshire. A beautiful and magical place, immersed in history that will make your kids feel like they’re a part of something bigger. 1066 Battle of Hastings, Abbey and Battlefield, East Sussex. Another amazing and very magical place to visit where the abbey and grounds are a place where your whole family can enjoy this one of a kind site. Tintagel Castle, Cornwall. One of the most spectacular locations in the UK with a very dramatic coastline. Your kids can experience Tintagel’s amazing history and imagine themselves being a part of the legend of Arthur. Where can I get cheap school uniform?